When is the Best time to Visit Lansdowne? To be honest, there is really no best time for anywhere that can be applicable for everyone. Every person will have their own preferences and factors that will decide when can they visit a certain place. Same logic applies in terms of the best time to visit Lansdowne as well. Some people arrive here looking to witness lush green hills while others come hoping to catch a snowfall. A lot of us go to hill stations looking to escape the scorching heat of the plains; while some people just want to spend time away from the crowd. Families with kids can travel only at a certain time and some people would like to avoid going anywhere in the rain. Keeping the above in mind, below is a month by month breakdown of how the weather trends in Lansdowne; and how this tiny peaceful hamlet changes its look and setting in the entire year. You can read through the information below and then based on your own preference, decide when you would like to visit here. 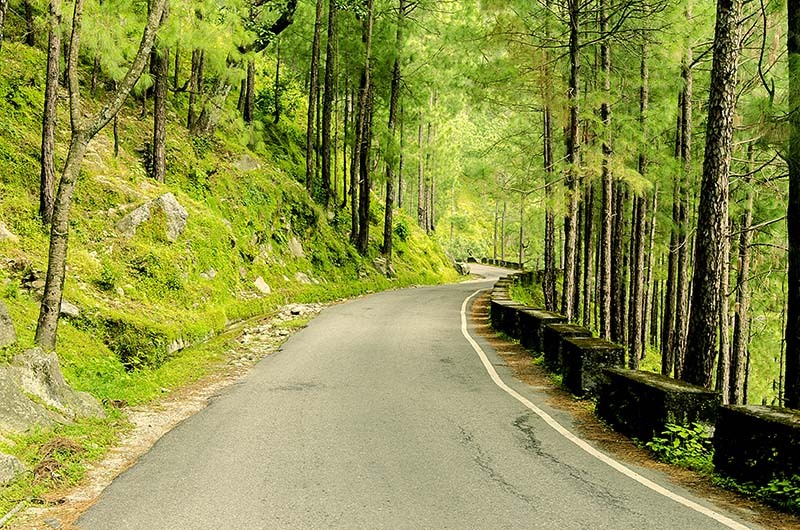 This post is in fact in continuation with a previous one; a Lansdowne Travel Guide where I have talked about different aspects of visiting Lansdowne; including details on how you can reach here; where can you stay; places to see and things to do. I would recommend that you read through this information at the link provided below. The months of March, April, May, June and September are considered to be the best time to visit Lansdowne from an overall basis. Spring arrives in April and the valleys turn beautiful, blossoming all around. It is not too crowded at this time either and the weather remains pleasant. By the month of September, the monsoon is mostly long gone but leaves behind plenty of greenery everywhere. If monsoon doesn’t bother you and it is greenery you are after, then July and August too are a great time to visit. Be advised though that landslides can occur at this time and you may be forced to remain indoor by heavy rainfall. If you want to take a chance at witnessing snowfall, then the month of January will be the best time to visit Lansdowne. It gets a bit crowded in the months of April, May and June and may not be the best time for someone who is not fond of crowded places. If you are not a fan of monsoon then you should avoid July and August as well. Surprisingly, weekdays in general are a good time to come to Lansdowne because there is hardly anyone around; but on weekends, people from Delhi and NCR rush here for weekend getaway. Due to this, the town sometimes gets a bit crowded and you may not find even a single room in any hotel. If you are traveling on budget, then go on a weekday and avoid weekends. You will find a huge different in hotel prices between these two times. Similarly, long weekends too will be a good time to avoid if you don’t want to be in a crowded place; or were traveling on a budget. To get a better understanding of the best time to visit Lansdowne, let me also provide more information on the weather of Lansdowne. The months from April to June are by far the busiest and most popular time of the year for Lansdowne. With summer vacations in schools and Lansdowne being a popular destination for families; tourists rush in here from all parts of the country but mostly from Delhi NCR. Almost every weekend here is a busy weekend but the ones in Summer can really send hotels packing to their capacity. Temperature in Lansdowne fluctuates between 15 to 30 Degrees Celsius between day and night. Weather mostly remains pleasantly warm with noon getting a bit hot. I was here once in June and we actually had to switch on the AC in the room. Summers provide great climate with clear skies and warm enough temperatures; perfect for several fun activities like walking around in the town, hiking to to Tip in Top and Hawaghar; to enjoy beautiful sunset and sunrises; or just spend some time in peace and solitude among the gorgeous snow-capped Himalayas. If it interests you then you can also try your hand at some photography in the nearby Kalagarh wildlife sanctuary. A great time to visit the area. Spring arrives in April and the weather turns pleasant with valleys blossoming beautiful all around. Average temperature ranges between 15 to 30 Degrees Celsius. Things get a bit hot during day in May; and it also gets a little crowded at this; specially the weekends. Temperature ranges between 20 to 35 Degrees. Initial part of the months remains busy still. Average temperature too continues to hover between 20 to 35 Degrees Celsius. Monsoon arrives in Lansdowne in July and remains till late August or early September. This is not usually considered as a good time to visit; and for good reasons as the region experiences quite a bit of rainfall. A continuous heavy deluge from the sky all day long can force you to remain indoor in the hotel all day long. Sometimes foggy views lead to bad visibility making the driving here a bit risky when mixed with wet roads. Another reason why it is not advisable to visit the town during monsoon is because the rains may also result in adverse road conditions or landslides. On a positive side though, if lush green hills is what you are after then this is the perfect time for you to come. The entire town gets covered in dew at early mornings and the scenery glitters with lush green trees. You will often find clouds coming down and engulfing everything in white. Remember those scenes from Bollywood movies when someones opens the window of a hotel room to see all white clouds hovering over the mountains? Well Monsoon is the time to see that. Temperature at this time too will range between 15 to 30 Degrees Celsius. By September it will start to get colder and you will need a thick blanket to sleep in. Monsoon arrives in July and the temperature will fluctuate between 25 and 35 Degrees Celsius. Not a great time to visit if you hate monsoon. Temperature ranges between 25 and 35 Degrees but it can rain anytime and sometimes for hours. September is among the best times to visit Lansdowne. There will be plenty of green around; and the weather will be pleasant with temperature hovering between 20 to 30 Degrees Celsius between night and day. Chances of rainfall too are much less in September. By October, cold starts to settle in and the temperature then drops by each passing day. Winters here are very cold with temperature ranging from 0 to 15 degree Celsius; depending on which month you arrive here in. Snowfall in Lansdowne is not that frequent and not that much but when it does happen, it can cover the entire town in whites of snow; making it a sight to behold. Nights will turn freezing with temperature dropping several degrees below zero. Sharadotsav fair is celebrated here during fall season. It is a 10 days affair during which a fair is put up in Lansdowne with folk dances and other cultural programs. There are ancient churches here in Lansdowne built by the British which also makes Christmas to be a great time to plan a visit. Autumn arrives in October. A good time if you want to see golden color valleys all around. Minimum temperature of 15 and maximum at 30 between night and day. . Nights are cold but days most remain pleasant with temperature ranging from 10 to 30 Degrees Celsius between night and day. Average temperature fluctuates between 5 to 20 Degrees Celsius between night and day. Extremely cold with chances of snowfall. Temperature ranges between 5 to 15 Degrees Celsius between night and day. Temperature in February ranges between 5 to 20 Degrees Celsius between night and day. Things start to get a bit warm in March with temperature fluctuating from 10 to 30 Degrees Celsius between day and night. I hope the information above on best time to visit Lansdowne was of help. If you have any other questions; or need any further details; please feel free to ask in the comments section below; or at our Community Forum; and I will be glad to answer.